In Pro Unity Game Development with C#, Alan Thorn, author of Learn Unity for 2D Game Development and experienced game developer, takes you through the complete C# workflow for developing a cross-platform first person shooter in Unity. C# is the most popular programming language for experienced Unity developers, helping them get the most out of what Unity offers. 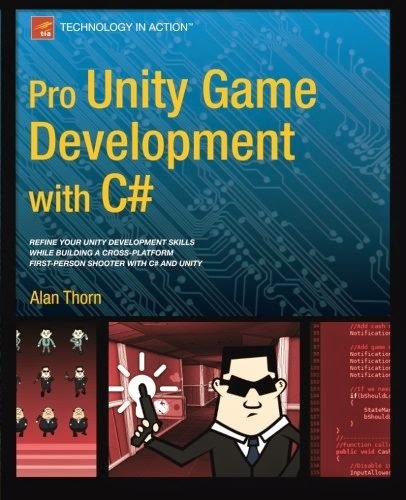 If you're already using C# with Unity and you want to take the next step in becoming an experienced, professional-level game developer, this is the book you need. Whether you are a student, an indie developer, or a season game dev professional, you'll find helpful C# examples of how to build intelligent enemies, create event systems and GUIs, develop save-game states, and lots more. You'll understand and apply powerful programming concepts such as singleton classes, component based design, resolution independence, delegates, and event driven programming. By the end of the book, you will have a complete first person shooter game up and running with Unity. Plus you'll be equipped with the know-how and techniques needed to deploy your own professional-grade C# games. If you already know a bit of C# and you want to improve your Unity skills, this is just the right book for you. If you already know a bit of C# and you want to improve your Unity skills, this is just the right book for you. Unity developers looking to improve their C# workflow and effectiveness, including game development students and professionals, indie developers, artists, designers, and those employed at game development studios.